After Birdman (2014) won best picture at the Oscars this year, I started thinking about some of my favorite movies that seem to have a similar, self-reflexive tone to them—more specifically, movies that focus on the actual production of films. I chose to stay away from some of the more obvious choices like Singin’ in the Rain (1952), and decided to compile a more unconventional list that was personal to me. Altman will forever be thought of as one of the greats in Hollywood, and stands as inspiration for countless younger filmmakers like Paul Thomas Anderson. The Player is a hilarious portrait of a Hollywood studio executive (Tim Robbins) as he gets death threats from a screenwriter whose script he rejected. This is a somewhat debatable choice for this list because it isn’t explicitly about the movie industry. It follows a man who, over the course of one day, goes from place to place to “act” in bizarre scenes, though neither cameras nor audiences seem to be present. 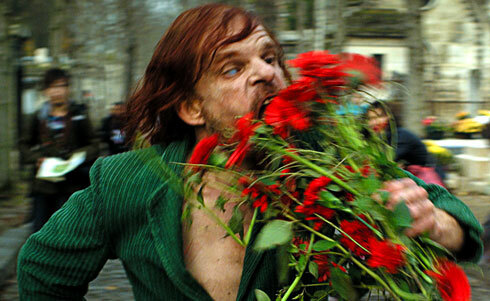 There does seem, however, to be a real love of films and the filmmaking process in Holy Motors. With each “scene,” Carax is able to delve into the different genres and settings, always keeping a balanced ambiguity between the metaphysical and genuine. What makes Adaptation so on-point is its roots in screenwriter Charlie Kaufman’s real life and difficulties in screenwriting. Nicolas Cage plays Kaufman and Kaufman’s fictional twin Donald. While Kaufman struggles through writer’s block while adapting a novel, his ditzy but lovable brother has no issue pumping out a highly successful horror screenplay. It’s a sharp and heartfelt look into Hollywood from a screenwriter’s perspective. Though Inland Empire (2006), Lynch’s most recent work, is also a thrilling depiction Hollywood, I chose Mulholland Drive for its richer complexity and confounding plot. The first half of the film follows a young woman (Naomi Watts) moving to L.A. to pursue an acting career. She gets tangled up in the mystery of another woman (played by Laura Harring) who has amnesia. During the second half of the film, it suddenly shifts and it’s unclear as to whether Naomi Watts’s character is the same person or not. Regardless, the version of Hollywood Lynch creates is drastic, bordering on disturbing. Unlike other documentaries with a focus on film production (Burden of Dreams , for example, which shows the making of Werner Herzog’s film Fitzcarraldo of the same year), Oppenheimer’s affecting documentary does something completely different. As a way to access the subjective and distorted memories of gang leaders from the Indonesian genocide of the ‘60s, Oppenheimer asks them to reenact their most memorable kills in any Hollywood style of their choosing and then films the scenes for them to later watch. The result is staggering, sometimes funny, and often chilling. Honorable Mentions: Tout va bien (1972), Day for Night (1973), Barton Fink (1991). Great list Catherine. I would add Cinema Paradiso – one of my all time favorite movies!